Simply combining a unit with an activated leader will not cause the leader to become inactivated. I've tested this additionally to my experience. I have a stack with [Curtis (inactivated) combined with the Railway Bde], Q. Gillmore, J. Ricketts (activated) and a battery. When I split Curtis and the Railway Bde. and combine the Railway Bde. 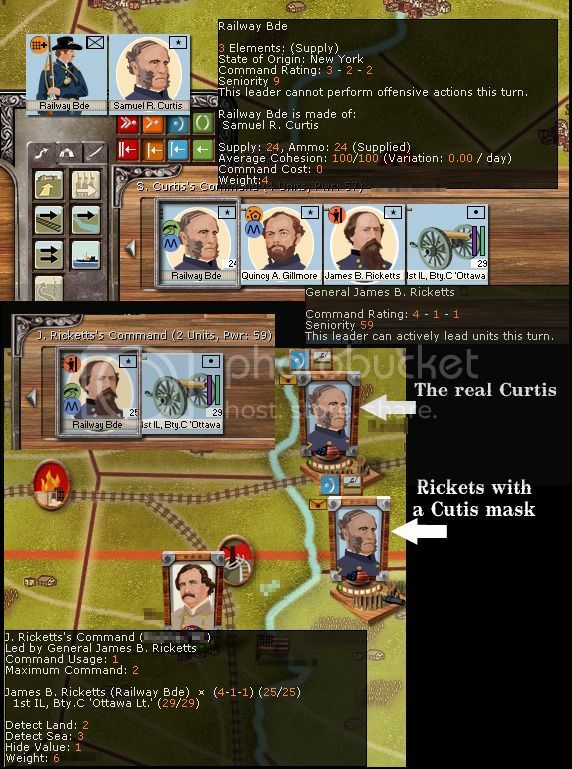 with Ricketts, Ricketts becomes inactivated and his unit-icon on the map turns into that of Curtis. I've tried this out with other combinations of units combined with an inactivated leader and recombining it with an activated leader. The leader always becomes inactivated when the unit formerly combined with an inactivated leader is combined with an activated leader. Can this PITA be WAD? Additionally the icon change is definitely a bug. Game and Backup1 attached.